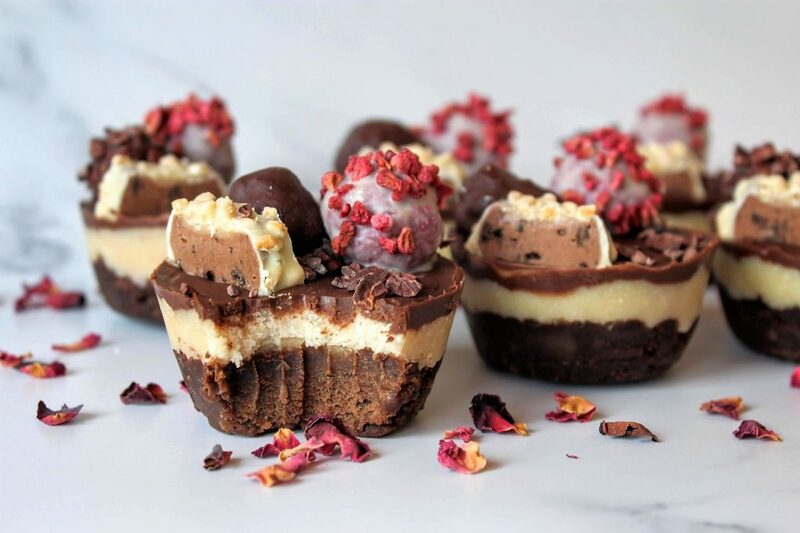 I’ve worked with protein brand Barebells for a while now and this month I had to share this special recipe – layered chocolate and almond cups topped with raspberry chocolate balls for an Easter touch – because is there such a thing as too much chocolate?! Using their delicious White Chocolate & Almond no added sugar bar to finish off the decoration, get making these and see how long they last! First make the balls: Place all of the ingredients into a blender or food processor (I use my Ninja Kitchen) and whizz up well until everything is combined. Get small portions of the mixture and roll into balls. Next melt the white and dark chocolates then coat the balls in either then place on a sheet lined with baking paper. 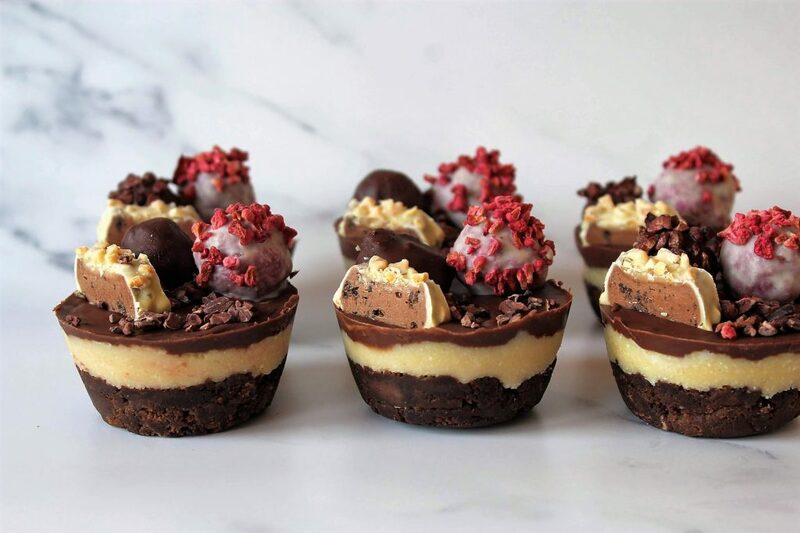 Sprinkle freeze-dried raspberries over the white chocolate ones. Chill for 1 hour. Make the base: Place everything into a blender or food processor and blend well until smooth and a thick dough has formed. Divide into 6 pieces and press between a 6 hole muffin tin to fill up to ⅓. Chill while you make the next layer. Melt the coconut oil and mix with the maple syrup and almond flour until you have a sticky thick paste. Spread over the base to cover and chill again. Melt the coconut oil then whisk in the maple syrup and cacao / cocoa powder to form a smooth sauce then pour over the coconut layer to cover – it should fill the top. 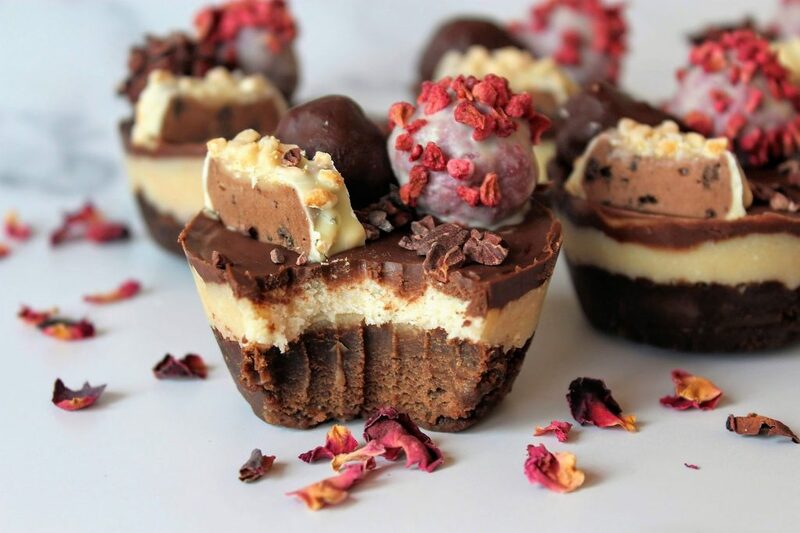 Place a dark chocolate and white chocolate ball on top of each as well as a slice of the Barebells bar. Sprinkle over cacao nibs and chill for at least 1 hour – then you’re ready to enjoy!